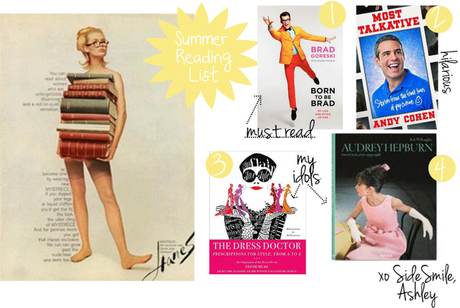 Here is my summer reading list! I just finished Born to be Brad (um, LOVE), and am about halfway through Andy Cohen's Most Talkative (he is just as hilarious in print as he is on Watch What Happens Live). Clearly I am in biography mode with all of my picks. I just love feeling like I'm getting a behind the scenes peak at all of these amazing people. 1. Born to be Brad by Brad Goreski. 2. Most Talkative by Andy Cohen. 3. The Dress Doctor: Edith Head. 4. Bob Willoughby: Audrey Hepburn.